Five original diamond delights that are both clever and hilarious. A must for musically-oriented baseball fans. "Baseball's Greatest Hits, Volume 2" is in the CD Baby store. Why Did You Go, Johnny Damon? 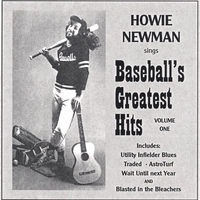 "Baseball's Greatest Hits, Volume 1" is believed to be the first album of original baseball songs by one artist. It was originally released in 1979 as a vinyl extended play record (a limited number of copies are still available in this format) and was remastered into a CD in 2001. In 2002, "Baseball's Greatest Hits" was accepted into the National Baseball Hall of Fame Archive. AstroTurf - A protest song that has apparently worked. Utility Infielder Blues - Inspired by Bob Heise and dedicated to the memory of Chico Ruiz, this "ballad of the bench" salutes baseball's part-timers. Wait Until Next Year - Remember the great Red Sox collapse of 1978? The '64 Phillies? The '51 Dodgers? If you do, this one's for you. Traded - A look back at the 1974 Tug McGraw trade. Blasted in the Bleachers - An ode to the cheap seats at Fenway Park. After ending an 18-year hiatus from the folk music circuit in 2001, Howie Newman has been delighting audiences all over New England with his unique combination of music and humor. Accompanying himself on guitar and harmonica, his concerts always include a few baseball songs along with satires and parodies of everyday life (and beyond). In August 2003, Howie and Chuck Brodsky put on an "all baseball" show at the Mozaic Room Coffeehouse in Avon, Mass. Howie's latest CD release, "Trust Me, You'll Like It," includes "Doug Mientkiewicz" and "Weekend Warrior (a tribute to one-a-week ballplayers)" as well as 11 other tracks with full band arrangements. It's available from CD Baby. "Here We Go Again," Howie's first CD, features a studio version of "Blasted in the Bleachers" plus six more hilarious originals, including "Mustang Mania," the official fight song of the 1978 SMU football team. It is also available on CD Baby. All of the songs are great...lighthearted and funny. It only could have been better if it was longer. A classic. Bought for Christmas present. Hope he likes it too. This is just fun to listen to. I bought it for a present. I think it will be a hit.